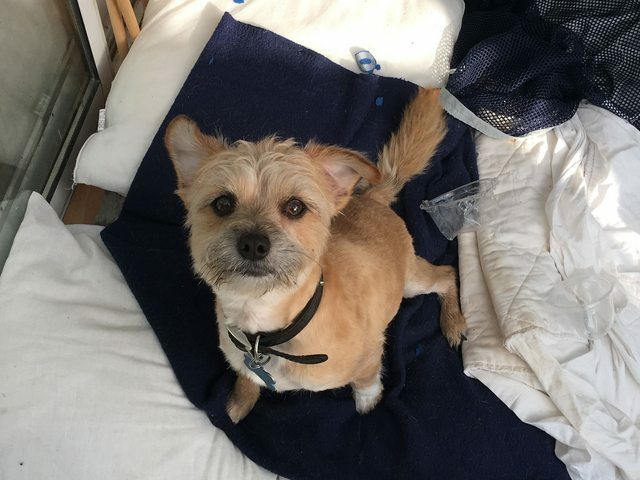 Alan is an 11 month old jack russell cross Chihuahua, neutered male. Alan came in to the rescue as she was unable to look after him and cope with the special needs of his legs. Alan has a condition called Luxating patellas, this is quite common in both of his breeds. Unfortunately for Alan in his left leg he had the most severe level of the condition and it required an operation to correct it. Alan has now had the correction on his left leg and bar a mild done infection he has recovered really well. Alan still needs to remain quiet and is not allowed any exercise and has to remain on cage rest for another two weeks, of which he is actually taking really well. The right leg also has the condition but it is at a very minor grade and causes him no pain, so the vets have said it will be better for him to leave it as it is. Due to his condition any body thinking of taking him on will have to take in consideration the following: Although his leg has been corrected, as with all operations none are guaranteed. If this operation fails it will cost £1000 -£1500 to be repaired, as this is a pre existing condition neither leg will be covered on insurance for anything related to this condition. He will need to remain on a supplement called yumove for the rest of his life, which cost’s around £8 a month. He will never be allowed to get overweight! so if you know you’re a feeder and your dogs have always been overweight please do not apply, excess weight will cause him extreme pain on his legs. He will need consistent exercise – for example he would NOT be able to cope with 30 mins a day and then a 6 mile hike on the weekend. His legs just could not cope with this. He will need an hour a day and then he could manage a maximum of a 2.5 hour steady walk on a weekend. Alan is a real character, when he came in he had not been well socialised with other dogs and is still very much learning. Alan has no malice in him, but he gets extremely over excited when he see’s new dogs, however if you are firm with him and make him calm down and introduce him correctly he is absolutely fine! Alan is very much an annoying little brother, so he would need to live with a patient dog or one of a similar age. 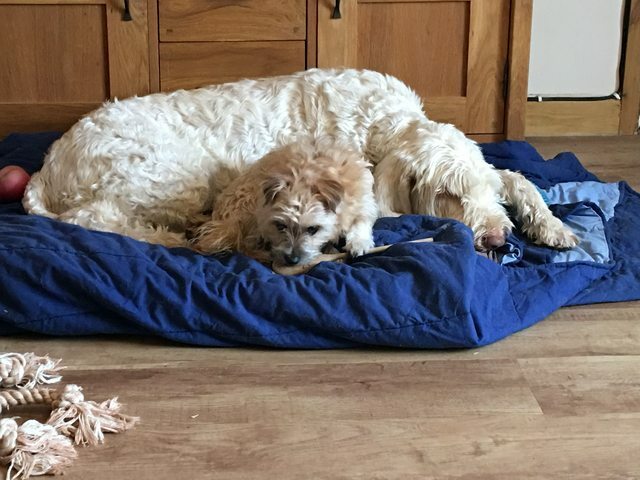 My little dog could not stand him when he first came, as Alan was like play, play, play and drove him mad, with in 4 days he had convinced my dog to play and now they never stop!! He is a terrible tea leaf and will steal whatever he can and take it back to his bed and bury it!! He is terrible on the lead and is learning to walk to heal and not pull!! Alan is fab off the lead and will try it on with most outdoor animals, however he is actually a wimp so as soon as they turn around he is off!! 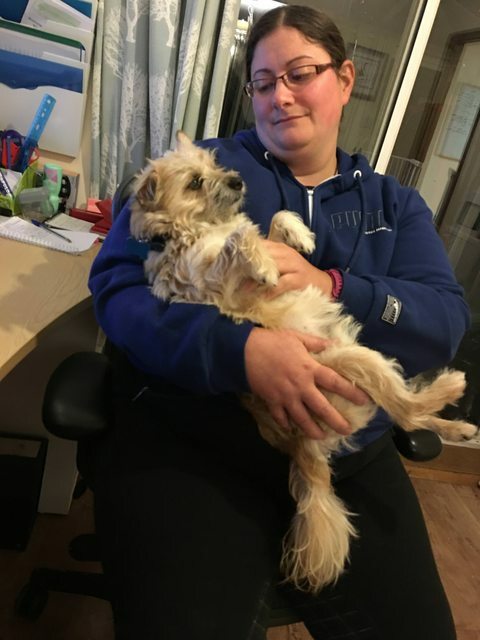 Alan would fit into most households, he would be suitable for children over the age of 8 years, he is good with cats (as long as they stand up for themselves) and is great with dogs as long as they can put up with his annoying ways!! 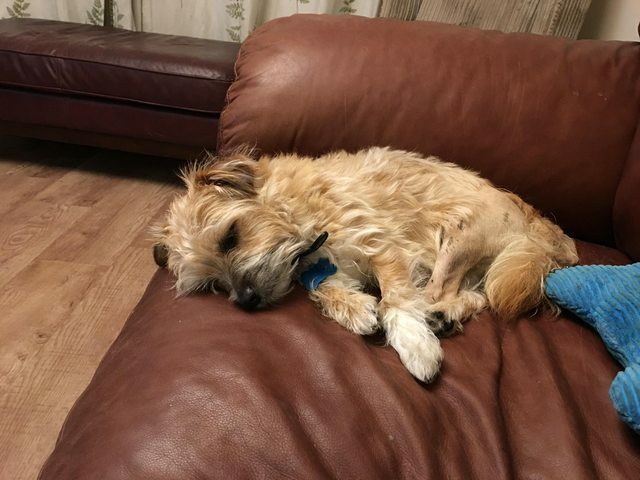 Alan is fully vaccinated, neutered, micro chipped, comes with 5 weeks free insurance (this will not cover his back legs) and is up to date with all flea treatment and wormer.